I have a confession to make. Despite loving to makan and try new places, I tend to order the same thing. If I'm at a local restaurant, my priority would be Nasi Lemak. If we're at a Western restaurant, I would order the chicken chop, spaghetti or burger. Yep, not that adventurous. I was at TGIF last Friday for a farewell dinner as a relative of mine is heading to University in a different state. I don't go to TGIF all the time, but when I do, I would usually order any of their burgers. 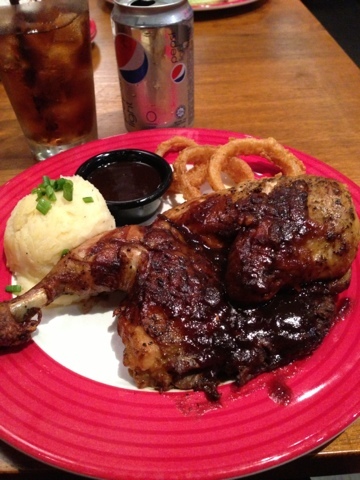 Half a chicken, with their BBQ sauce, served with mashed potato and onion rings. Except for the chicken bones, every thing was gone by the time I completed my meal. Just imagine I was THAT hungry because I don't usually finish my food! This Championship BBQ Chicken is really a champion. My fave from TGIF now!